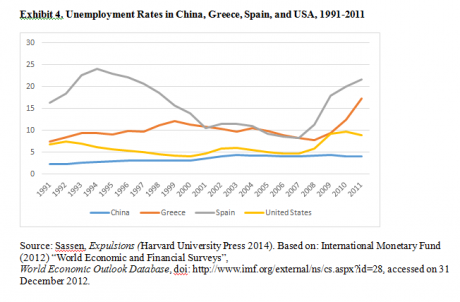 Here are some tables and graphs that show how Greece is not unique in its crisis: it is one of the most extreme versions of a broader trend that is affecting many countries in Europe, and some beyond Europe. Here I bring in some empirical data to show how Greece is an extreme version of what is also happening in EU countries generally considered to have recovered from the crisis. For instance, in a country such as the Netherlands, state support of the lower half of the population is shrinking, and inequality is growing due to economic restructuring of labor markets. This is a trend that repeats itself in much of Northern Europe. In the following graphs I show the extent to which the Greek case follows a major pattern evident in much of the rest of Europe and the US. (Elsewhere I have made the case that the austerity programs of the EU are akin to the restructuring programs developed by the IMF and the World Bank for the Global South (see Expulsions, ch.1). 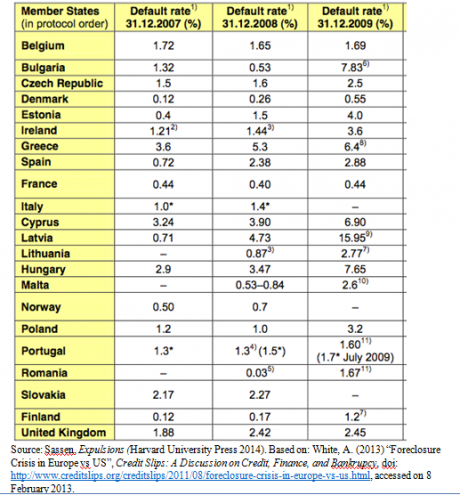 Among the key factors that have taken Greece to an extreme version of what also affects many of the other European countries is the fact that most Greek capital owners simply do not reinvest in Greece, do not pay their fair share of taxes, and generally do not pay the state for some of the privileges they get, notably television licenses (see, for example the Financial Times, 7 January, 2015). Many are based in the Londons of this world. As a result the Greek government lacks needed resources. But its response has not been to impose some discipline on the "oligarchs" as they are referred to, but to impose brutal cuts on the modest earnings of half of the country's workers and families. (I describe these often brutal cuts in ch.1 of Expulsions.) And too much of the EU's demands have had the effect of merely strengthening these brutal cuts. 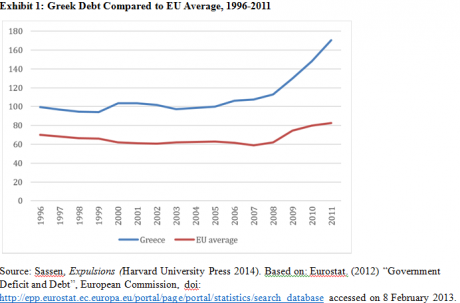 The first graph shows that Greek debt Compared to EU Average, 1996-2011 follows a fairly similar trajectory. 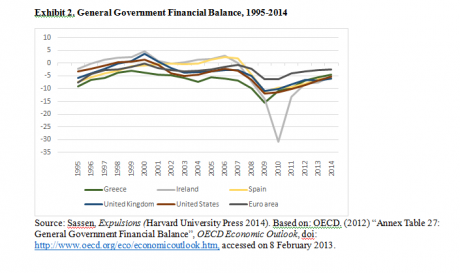 Similarly with Exhibit 2 on government financial balance 1995-2014. It is more extreme, even though not as extreme as Ireland. 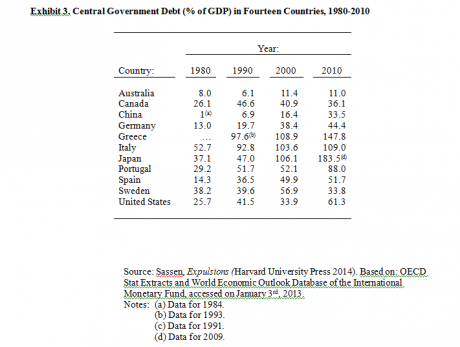 Exhibit 3 expands the data base to non-EU countries and shows how most have seen increases in government debt - with Japan, Greece, Spain, Portugal and the US the extreme cases; but also Germany seeing an increase in its government debt, from 13% of GDP in 1980 to 44% in 2010. Exhibit 5 focuses on a few very diverse countries: it shows, again, that the rise in unemployment was a fairly general trend in many countries, with China the exception. The last two exhibits focus on a very different set of issues. Exhibit 6 focuses on the rise of foreclosures in Europe when home buyers/owners default on their debt. 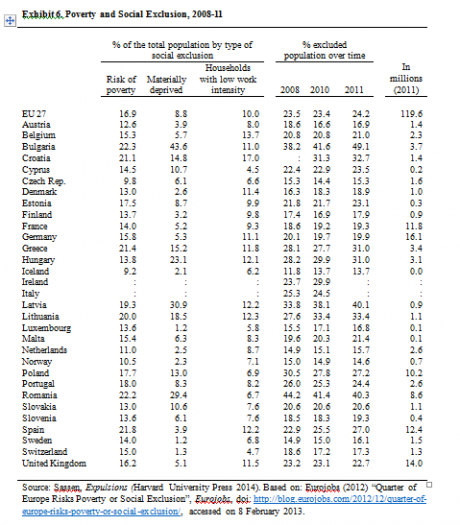 Again we see that Greece is not alone in this trend, even if it is particularly acute. The last Exhibit focuses on Poverty and Social Exclusion in Europe from 2008-2011 and it shows a more negative situation than one might expect given the enormous focus on Greece, Spain and Portugal as extremely problematic cases that deviate sharply from the general European situation; well, they don't really. Greece has about 29% from 2008 to 2011, which is a disturbingly high share, but lower than that of several other European countries. More generally, it is not alone in the European context: the average for the EU was just under 23%, and not that much higher than in some of the highly developed countries of Europe: about 23% for the UK, 21% for Belgium, 19% for both Germany and France, 18% for each Denmark and Finland, 17% for the Netherlands. These graphs capture just some trends; in the book from where they are drawn (Expulsions) I cover far more variables. My main point is that what is happening is far deeper structural reorganization in most of the developed world that the policies being deployed by the EU fail to acknowledge. Putting an extreme focus on Greece becomes a way of detracting from that deeper transformation. According to the Financial Times (7 January, 2014), a focus on the oligarchs - which is what marks the Greek difference and makes it more extreme - is becoming critical and something that also Germany would like to see. The ultimate irony has happened: The FT, Germany and Syriza actually agree on one item (and what the current party in power did not deal with): disciplining the oligarchs.